Apparently, there is something called the World Cup that is a big deal. I guess it’s a soccer tournament or something. Whether or not you are familiar this Bizarro World game of ‘football’ doesn’t matter, because now you can take home a piece of the action (at least until it melts away). 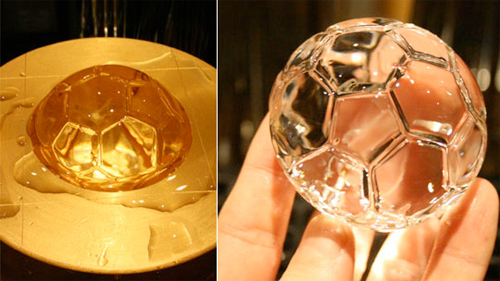 For $1,818 (rabid soccer fans, you know), you too can drink like a soccer star with the Soccer Ball Football Ice Mold. 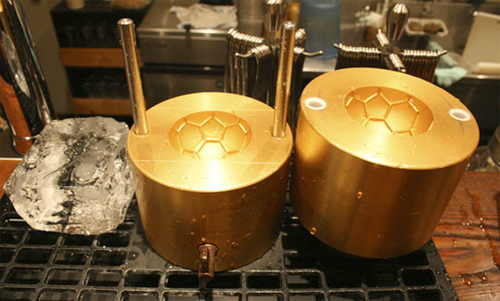 The idea is to warm the device in hot water, add ice, and clamp it together. Excess ice melts away, leaving a perfectly rounded ice sphere, complete with the familiar markings of an (old-timey) soccer ball. For the casual fan there is an option too: the Ice Ball Maker Mini Version is available for some reason at 10% of the price. Guess it’s go large or go home when it comes to the world’s most popular sport. Go team!